https://c1.staticflickr.com/1/727/22903056919_be5792d22e_z.jpg https://c1.staticflickr.com/1/596/22651208494_965e3d0271_z.jpg https://c2.staticflickr.com/6/5784/23171362572_87a770e12c.jpg https://c1.staticflickr.com/1/604/22652487113_a2daed96e6.jpg **[Designer and brand introduction]** https://c2.staticflickr.com/6/5671/22652487833_8b2cf903fb_z.jpg **[product specifications]** Name of Product: Sweden SKEPPSHULT Cast Iron Steak Frying Pan 28cm Pot diameter: 28cm Pot depth: 3cm Handle: 22cm, beech Weight: 3.15KG Origin: Sweden **[Daily cleaning TIPS]** § Under normal circumstances, do not need to use special detergent, please avoid using the dishwasher. § When the pot is away from the fire and there is still room temperature, inject warm water with the brush to clean. It can also be heated by direct injection into the water after use, and the cleaning power is enhanced by the hot water with higher temperature. § If the bottom of the pot has browning burnt, it can be deeply cleaned. Inject a little water to cover the bottom of the pot. After adding the coarse salt, heat it to a high temperature for about 1-2 minutes until all the water has evaporated. Rinse off the remaining salt with water and wipe it with a paper towel to keep it dry. § After cleaning, please make sure the pan is completely dry and stored. **[Additional Note: General Cooking & Daily Use & Maintenance Guide]** **[Opening the pot]**Depending on the panning procedure on the market, before using it for the first time, first wash it with hot water and then dry it with a paper towel. Then heat the pan to a completely dry heat until it is completely dry. Apply a thin layer of cooking oil and heat for about 10-20 minutes on low heat. After the oil is absorbed by the pot and cooled, it can be used. **[Features]**In addition to microwave ovens, it can be applied to various types of direct fire heating methods. As long as there is no heat-resistant shovel such as wood or silicone with sharp corners, it can be used together. Cast iron has stable heat conduction and good heat storage effect. Therefore, most of the cooking process can use medium and small fires. When preheated to the ideal temperature, it can produce a good temperature constant effect, without cooling by adding fresh ingredients, it is especially suitable for cooking high temperature barbecue or fine fire stew. When moving the pot, be sure to be careful to heat it at high temperatures. **[Texture]**Because the texture of the iron pan is brittle, in addition to avoiding knocking, excessive temperature difference is also likely to cause chipping. It should be avoided that the frozen food should be placed directly into the pot, and it should not be washed quickly with cold water after cooking. 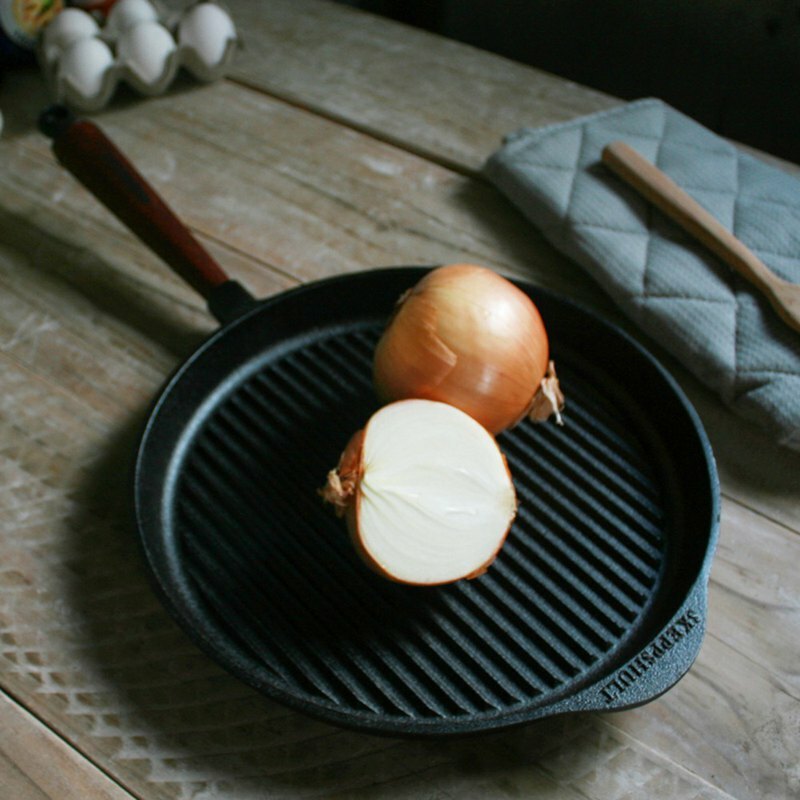 In addition, due to the natural material properties of uncoated cast iron pans, such as long-term exposure to acidic foods (such as: red wine, etc. ), dishes are susceptible to metallic taste or discoloration, so it is also less suitable for long-term slow stewing of acidic ingredients. **[Cleaning]**Do not use the dishwasher or use detergent to clean it. After each use, simply remove the residual ingredients, rinse gently with hot water with a bristle brush or sponge, dry with a paper towel or place on the stove to dry, keep dry thoroughly, and finally wipe again A thin layer of cooking oil is used to complete daily cleaning and maintenance. In fact, as long as it is used frequently, it is the best maintenance of cast iron pots. https://www.books.com.tw/img/N00/050/78/N000507887_t_35.jpg **^o^ About Nuguo. Frutti di Nuli** "Nuoguo" wants to be a life partner with temperature around you, to satisfy all your imaginations of everyday life that is comfortable and comfortable. "Nuoguo" has been working hard... on this planet, to search for ingenious intelligence and articles for you. Whether it is style at home. Recreational groceries. Meal eater. Small things. With the sharing of these values of life, I hope to add more to the world, if you design through your beautiful mind.